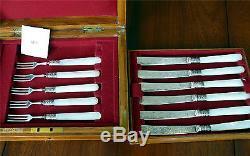 EXCELLENT VICTORIAN FISH SET IN LOCKING WOOD BOX MOTHER OF PEARL HANDLES, SILVERPLATE BLADES ON KNIVES, STERLING BAND. 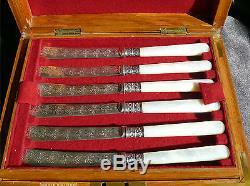 The set has mother of pearl handles. 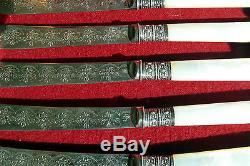 The knives have a floral decorated silverplate blade and the decorative bands are sterling silver. There are 6 knives and 5 forks to the set. 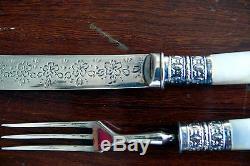 The knives are 7-7/8 in length and the forks, 6-3/8. 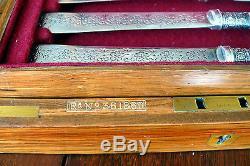 The knife blades are marked by maker M&Co, EP, NS (electroplated nickel silver). 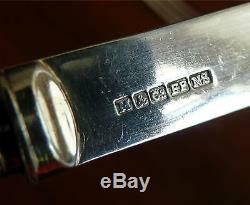 The sterling bands are marked by maker GHB, Sheffield, Sterling mark and date code for 1901. 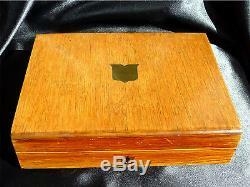 The box has a British registry mark dating it to 1900. There is no damage to any of these pieces. Stuff You Should Read About How We Do Business. We do not end auctions early for offers. All our auctions are no-reserve. We guarantee your satisfaction on all items we sell. If we have missed something, which does happen from time to time with the antique and vintage items we handle, we will always make it right. Porcelains and figurines are cleaned unless stated otherwise. And everything is packed with the utmost care for the safe arrival of your treasures. Analyzing "Smart Counters" only at inkFrog. The item "Antique Sheffield Fish Set in Locking Wood Box, MOP Handles, SP Blade, Ster Band" is in sale since Saturday, April 09, 2016. 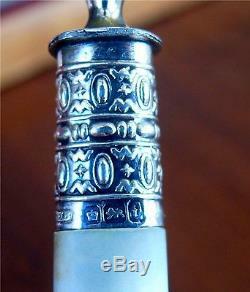 This item is in the category "Antiques\Silver\Silverplate\Flatware & Silverware".ways" and is located in Surprise, Arizona. This item can be shipped worldwide.